I am a Nuu-chah-nulth writer. I write to strengthen, maintain and recognize changes in the cultural traditions of our peoples. I use words as a medium to express our tradition and to interface between past and future generations. I am Wilma Keitlah. Tse-shah-aq-suup – a woman from the Tseshaht tribal amalgamation of Barclay Sound tribes. I was born and raised in the Alberni Valley. I grew up on Tsehaheh I.R. # 1. 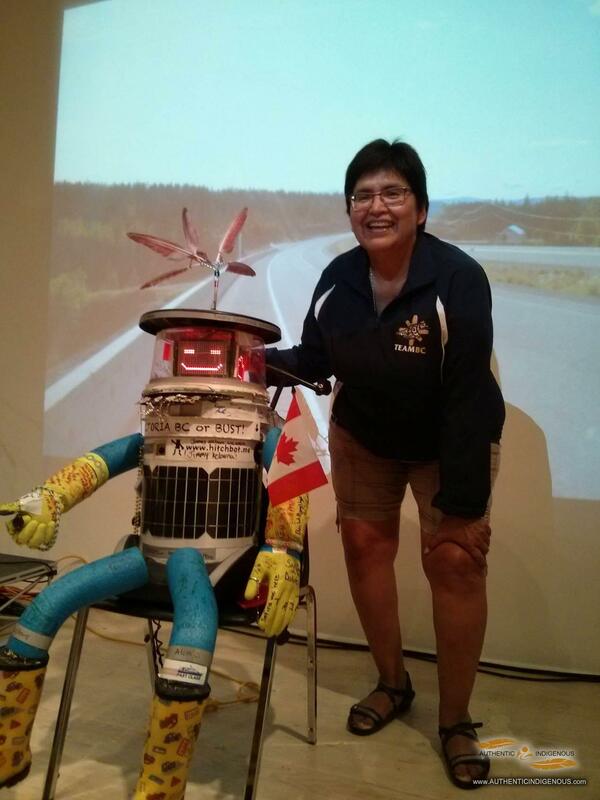 I hold the name Hee-inna-tuk-wiss from the Keitlah and Atleo families of Ahousaht. My parents, Ramona and Wesley Gus, both valued education and have supported, promoted, and encouraged me in my educational achievements. I come from a family background rich in artistic expression. My great grandmother, Emma David, was an accomplished basketweaver and a storyteller. My mother remembers looking down from the ceiling watching herself in bed listening to her grandmother’s stories. My grandfather was also a storyteller. He would tell my mother stories, and make them humorous with things like having Mr. Raven driving a car down Third Avenue. My great grandmother taught my grandaunt, Mabel Taylor the art of weaving so even though I never knew her, I was touched by her through Auntie Mabel and her work. My mother’s uncle, Roy Taylor carved canoes, masks and whistles. When he died he left his carving tools to my mother as the only child of the next generation. My mother took up carving in her early thirties and became an accomplished artist. I grew up with the smell of cedar shavings. I am a traditional dancer and have danced for almost fourty years. I have been an educator for twenty-five years. I am a published author. I wrote the book, “waawaachuk yaqwii?itq quu?as. – The Sayings of Our First People”. I have developed curriculum for BC First Nations Studies 12. I want to teach people around the world that we as Indian people still exist in the modern world and to build understanding and relationships. I want to explore First Nations Fine Arts wherever they may be, in order to strengthen our understanding and develop opportunities for First Nations youth, and to build relationships and understanding with others. I want to explore arts as a means of healing ourselves, to employ culture as medicine to feed our spirits. Art is an integral part of our culture. It is representative of our way of life and our spiritual beliefs. It can bridge and negotiate healing. Our people all over North America had challenges surviving in the environments we lived in. We all worked hard and we all had expressed ourselves creatively. Art is always transforming, changing and shifting in space and time. Designing cross-cultural professional development activities: visiting American Indian colleges: Northwest Indian College at Lummi, Washington, Heritage University at Toppenish, Washington and Salish-Kootenai College at Pablo, Montana. Seattle Cross Cultural Visit to Seattle Indian Centre, Seattle Indian Health Board, Daybreak Star Indian Cultural Centre, Washington University, Burke Museum, the Indigenous Beauty Exhibit at the Seattle Art Museum and the Tulalip Site of Northwest Indian College. My plans are to represent myself as an authentic First Nations woman at international events and venues such as the Summer Olympic Games, the Pan American Games and at International Expos with the intention of teaching people that we still exist in today’s world in order to build understandings and relationships. I also want to explore authentic Aboriginal Fine Arts in overseas collections to tell their stories to our communities in order to build relationships and understandings among our own peoples and younger generations.